These period performances have an awful lot going right for them. For one, Herreweghe is an erratic but occasionally exceptional conductor, and he's allied here with a mostly exceptional orchestra that reminds one of the days where an orchestra's name was impossible to say. Kidding aside, the approach is entirely modern and seems determined to avoid the usual period-instrument sound – that is to say weak and scrappy strings, crude brass, and ineffectual winds. Don't mistake me; some period recordings are absolutely incredible, but often they are not. This is very good, but not great. On the plus side, the Orchestre des Champs-Elysées is one of the better period groups I've heard recently. Indeed, it has one of the better wind sections out there, and there is some simply lovely solo work here. Additionally, the brass has an assertive edge that doesn't turn crude, and there are no ugly sounds anywhere. All three works are unusually exciting and full of zest. Most importantly, there's still warmth and humanity present. The strings play well and there is a welcome attention to the actual sound that is being produced. There's no gimmick that can mask ugly playing, so it's a relief that the production values are so high. The famous Symphony #40 has been tabbed by the professionals as the standout of the set, and I don't disagree. The winds simply steal the show and as a whole, this is really a thrilling and engrossing performance of a work I thought I had heard too many times. Conversely, these performances are just too driven, especially in slow movements and minuets. Not everyone wants Mozart to be all surface beauty, but that doesn't mean you can ignore the beautiful things he wrote. While the finales of each symphony are thankfully sane in both tempo and execution, I can't help but feel that all this excitement comes at a large cost. Compare to Szell on Sony Classical, and you'll find the same thrilling outer movements combined with warm and singing inner ones…and this from the man who was often told he didn't make Mozart pretty enough! 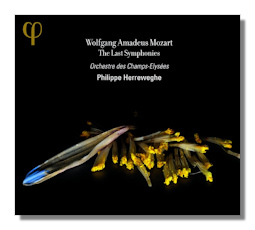 All and all, if you're sick of traditional Mozart but wary about quality from the period crowd, give this a go. It isn't perfect, but of its type there are few better right now. And that's the shame of it, because it could have been essential.